How to make an elegant UI design for Android app? This article collected 10 practical Android app UI design examples that are very popular in people’s daily life. A market study showed that the market gap between iOS and Android is growing. Android devices are becoming the leading actor in the mobile application market. Apple's flat design style is very hot in recent years, but the Material Design-led Android app UI design is also worth to be noticed and studied by designers. How to make an elegant UI design for Android app? There are a lot of resource and reference materials dispersed on the Internet. 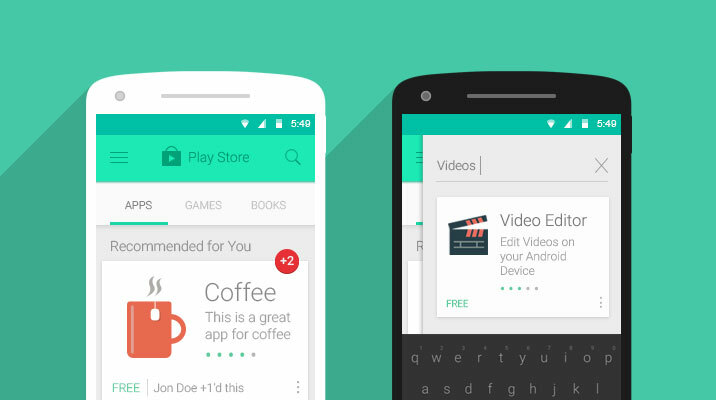 So here Mockplus collected 10 best Android app UI design examples that are very popular in people’s daily life. Be the same with Apple’s App Store, there are plenty of weather apps in the Google Play Store. Eye in Sky Weather stands out for its minimalist, holographic themes and the basic features of a weather app should be expected by users. This application includes the 14 best weather icon sets that you can add your own. Four widgets and one scalable notification are available, which is highly customizable. There is also a DashClock extension. Snapseed is a comprehensive photo editing application from Google. In addition to the basic editing features provided by Instagram, I also appreciate this type of editing, making photo editing easier than ever. Many photo editing applications make this process cumbersome, but Snapseed keeps it simple and offers many options that can be easily adjusted. Of course, you can change the lighting and add filters, but the ability to refocus the image and change the style of the film makes their toolbox unique. And finally, based on the saving, re-editing capabilities you've built in the past, make this app be my favorite photo editor. YouTube, the world's largest video-sharing website, has been benefiting from their smart design since its founding in 2005. The same inspiration runs through today and you can see the easy-to-use services of mobile apps on iOS and Android. Likewise, while YouTube is not a dedicated mobile application,but more than half of YouTube's video is viewed on mobile devices. The need for such an application in 2017 is very clear. So it’s UI for Android and iOS app is the same important to some degree. YouTube has done a great job keeping the design accessible and fresh, updating applications every two weeks and adapting the design to the changes they make to the platform. In fact, most users prefer the mobile version. 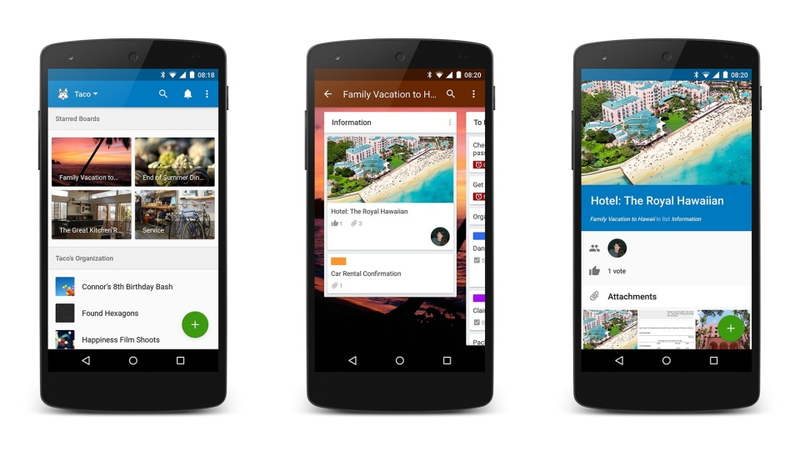 One of the newest contenders for the most beautiful Android app UI design is the social scrapbooking Pinterest. From a carefully implemented sign up process to a full-scale display of photos, Pinterest added enough detail to the user interface to keep the images and content at the center. Trello is a project management and organization tool whose main job is what they call "the board of directors." Each board can correspond to different tasks or responsibilities and needs to be completed. Simple and obvious design makes the work can be completed faster, and reduce the communication error between the parties. Trello is a good example of user experience design because it does not have too many unnecessary functions. Everything on the home screen of the app is easy to understand and works exactly the way the app does, without any confusion about any task going from one board to another. Interface design is very intuitive, the first user of the application can easily browse different pages. Slack is a team communication tool of all shapes and sizes. Whether you're planning an event, working on a project, or just getting tired of e-mail, Slack is becoming one of the most widely used tools among professionals. The key to this success is their simple yet powerful design. Although Slack is not a specialized mobile application, his user experience on mobile devices is no worse than on a computer. Everything you need is very clearly placed on the left drop-down menu, and the team feed is always updated in the main area of the app. Duolingo is a language learning company that teaches users how to speak different languages through mini-games and short courses. Founded in 2009, the company has reached 100 million users and continues to grow, mainly due to the simplicity of their applications and the constant innovation of technology. Anyone using Duolingo understands the simplicity of the application. By completing a mission or game you can go to more advanced categories. It is also a great idea to combine the addictiveness of mobile gaming applications and use it to learn new languages, on the basis of which the user experience is also one of the factors that appeals to the user. Wickr is as easy as many effective mobile application UI designs. It perfectly handles the safety message while maintaining its basic black and white design. Whether the user is out of business or personal choice, are safe ways to send encrypted messages. It has group messaging capabilities, as well as one-to-one communication. The sender of the message can control how long a message, image or video can be viewed. Messages like Snapchat can only show 1-10 seconds, and over time it will digitally fragments the deleted message. Hipmunk is the quickest and easiest way to plan your trip. This app will save you time by comparing all top travel sites, including reminding you of where you want to travel, viewing reviews of other passengers, booking flights, searching for hotel rooms for the closest destination you want Wait. The design aspect I really like about it is that it can tailor your view to your needs, such as city-based card layouts, or the best time for a budget hotel. This is a truly customizable application for booking travel arrangements. PEAR is a personalized fitness app that puts thousands of workout and personal trainers right in your palm. This app surprised me because it exercises your health data in real time to suit your specific needs. It requires some exercise, such as running, cycling and weight training, and based on which one you choose to provide encouraging sound. It syncs with all the major fitness trackers and applications to keep all exercise data easy to manage. As Android developers, you can refer to Google's Android Design specifications, the official for how to make Android App UI design has always had a lot of guidance and suggestions. Github's UI Design section gathers lots of design-related material and great design sites. Not only limited to Android application interface design. 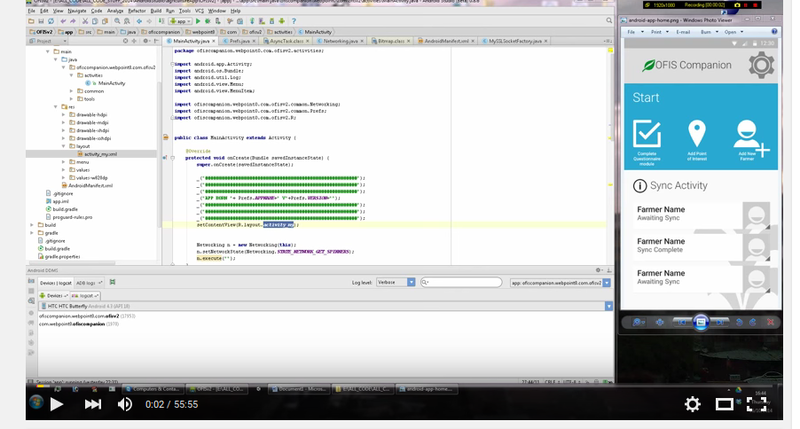 This video explains to Eclipse users how to create a graphical user interface for your application using Android Studio. The video is long (nearly an hour), but the process is logically easy. One of the best tutorials for Android UI layout and animation. It teaches you how to use Android Studio to create different layouts (frame layout, linear layout, relative layout and grid layout), views (TextView, ListView, ImageView, GridView, RecyclerView) and actions (Attribute Animation, Drawable Animation). This tutorial is for beginners and advanced designers and is available on GitHub. I think the prototyping design is a basic step to decide the style of an App.In the prototype design stage of the App, designers should be cautious to select and use the UI elements in prototyping tools. Based on the characteristics of Android applications, Mockplus and Justinmind tend to be more in line with material design. 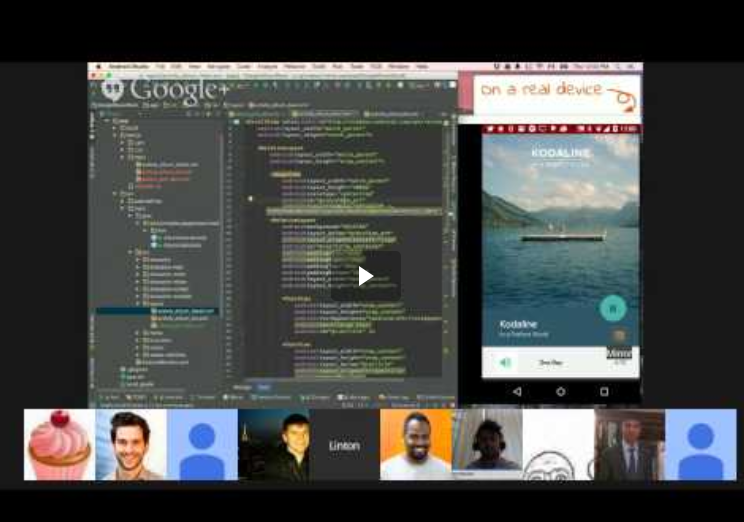 Good online collaboration and handoff also helps designers and developers create a gorgeous android app. At the android app design implementation and handoff stage, in compared with communicating with each other through social networking tools again and again, an online design collaboration tool, such as the Mockplus iDoc, is the best to saves your time and efforts dramatically. Why to choose Mockplus iDoc? 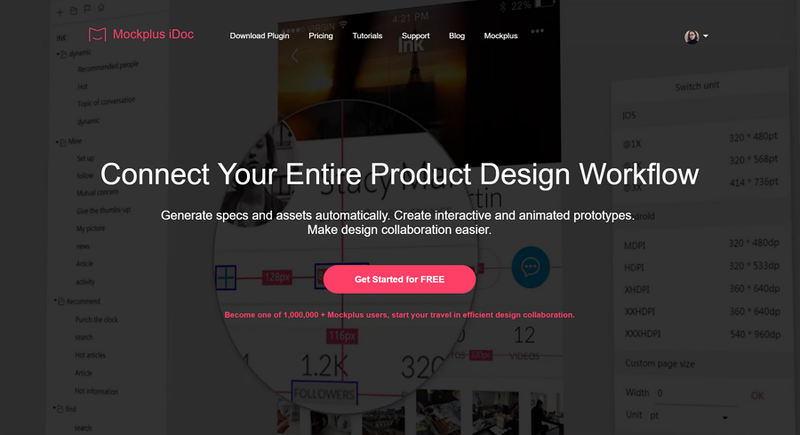 For designers, Mockplus iDoc helps export designs from Sketch/Adobe XD/Photoshop with one click, handoffs designs with spec/asset/code snippet details effortlessly and collects comments and feedback about android apps with ease, etc. For front-end developers, Mockplus iDoc helps access and browse specs in different ways, search duplicate elements and colors easily, check and download design assets freely, and get pixel-perfect code snippets that makes sense with one click. For product managers, Mockplus iDoc helps manage design projects more effectively such as creating/showing page relations with simple drag-and-drop, add comments and communicate with other team members on android designs in seconds, and upload documents in different types with one click. In short, to create the best android app collaboratively, Mockplus iDoc is a good choice for you.